CBD Oil for Health: Relieving Pain, Reducing Stress, and Restoring Health the Natural Way by James D. Coley speaks about the benefits of cannabis oil and how it can be used. Cannabis helps people in many ways and comes in many forms. Cannabis oil is one such form and though it contains the many benefits that marijuana has, there are no adverse effects while using it such as getting high. The oil works to help users in a natural way, which makes it unique. 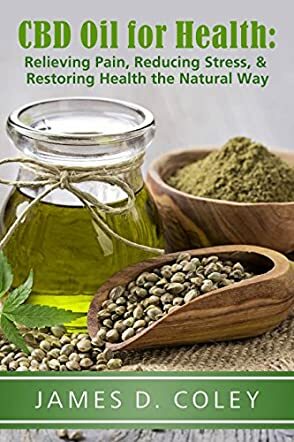 The author discusses skin and beauty care treatment using CBD oil, tips for cooking with it, how to use it at home and for pets, the availability, dosage and the side effects, and the differences between CBD, cannabis, hemp, and THC. The author discusses the topic extensively and methodically, and clears up a lot of myths and doubts surrounding it since the oil is derived from marijuana. The oil form is versatile and can be used in various foods. The book also discusses the various women's health conditions that can be addressed with CBD oil. The book is written in a simple and down to earth style that makes it easy for readers to comprehend the details of CBD oil and its various forms and uses that can actually be used to improve overall health and well-being. Readers will be familiar with the medicinal benefits of CBD oil and the best ways to use it once they finish reading this book.